POI "Points Of Interest" are points on the map (GPS coordinates with descriptions) that you are interesting in and that you want to store. It can be a place of business meeting, destination of tourist trip, location of parked cars, etc. POI pocket is a web and mobile application designed for planning, sharing, and synchronization POI. The Web version allows convenient planning and working with POI on the "big computer". With the mobile app you have your POI always with you. 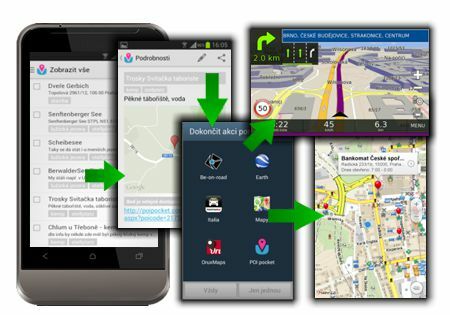 Points on your mobile or tablet you can easily view and mainly forward them to your car navigation (Tomtom, Sygic, BeOnRoad, ...) or mapping applications (Google Maps, Locus maps, Orux ...). How to start - learn how to start working with POI pocket. 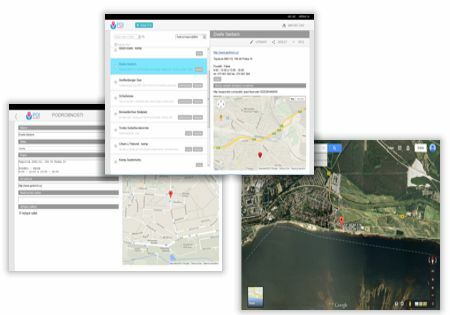 Easy creation of new POI, smart location search (based on GPS coordinates, address, URL to various mapping applications....). Easy forwarding POI to many web mapping applications. The ability to send more than one POI at one time - route planning. Public sharing of POI or POI groups - send POI to anyone via short URL link. Export POI to various data format (GPX, KML,...). Synchronizing with any number of mobile devices. Add-ons of web browsers for even easier creating POI - simply by marking text. Synchronizing with web applications, the ability to work offline. 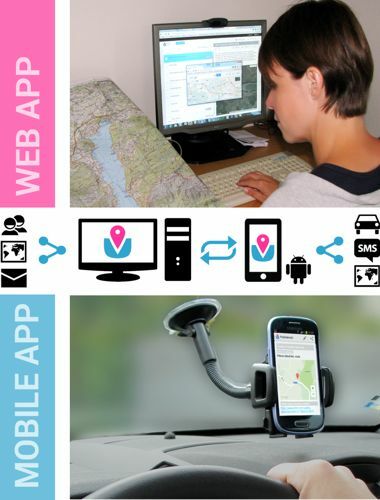 Easy forwarding POI to other mobile applications (car navigation, mapping applications,...). Quickly create POI from your current location. Public sharing POI - send POI to anyone via email or SMS. Support for tablets and mobile phones - various layout of forms. Extension allows you to quickly create new points from any page. Select the text in menu (address, GPS coordinates, ...), right-click and choose "Create POI". The following applications work well together with the system POI pocket. Do you know another application that interacts with the POI pocket. Tell us about it on poipocket@poipocket.com .